Charles Hamilton performs Sunday at Silo’s in Napa. Charles Hamilton is a Bay Area jazz veteran who has been, as an educator and mentor, an essential figure in the development of an array of homegrown jazz all-stars, including Joshua Redman, Miles Perkins, Josh Jones, Thomas Pridgen and many others. Sponsored by the Napa Valley Jazz Society, the Charles Hamilton Quintet will perform Sunday afternoon at Silo’s. Originally from Baton Rouge, Louisiana, Hamilton moved to the Bay Area as a teenager and, after earning a music degree at San Francisco State, began a long, successful career as a professional musician. 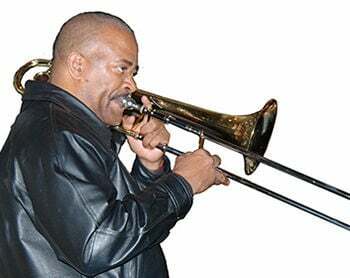 A much-sought-after jazz trombonist, he was a member of several respected U.S. bands and orchestras and made a number of high-profile international appearances, including the Montreux Jazz Festival, the Sea Jazz Festival in Rotterdam and the Vienne Jazz Festival in France. As the founder and director of the San Francisco Bay Jazz Band, he led international goodwill tours on behalf of the U.S. State Department. These included stops in Jordan, Vietnam, China and Japan. In 1981, Hamilton was appointed director of the Jazz Program at Berkeley High School, a position he held for 28 years. In that role, he created a remarkable breeding ground for jazz talent, and inspired and nurtured two generations of professional musicians. Currently, he directs the UC-Santa Cruz Jazz Big Band and the High School Combo of The California Jazz Conservatory in Berkeley. On the phone last week, Hamilton, from a career-long perspective, reflected on the state of jazz in America today. He was not optimistic. “Jazz is definitely fighting for its life,” he said. “It’s a different time now, and the recording industry is struggling in terms of trying to find the talent. And not just the talent, but that selection of talent that can perpetuate the music and the industry itself, monetary wise, you know? “About 1980, ‘81 is when things started changing in the jazz world economically. The musicians on the scene at the time, the very prominent ones like Miles Davis, and all the other musicians that were an offshoot of Miles like Herbie Hancock and Wayne Shorter and so on, they were starting to age a bit, and the industry was looking for some new blood, some new energy, that would perpetuate the jazz scene. Despite his downbeat assessment, Hamilton has not personally given up. He formed his new group a year ago, is currently touring and plans on recording a CD of original compositions in 2016. The Charles Hamilton Quintet is Hamilton on trombone, Danny Zin on saxophone, Glen Pearson on piano, Marcus Shelby on bass and Leon Joyce Jr. on drums. Sunday, Dec. 13, 4 p.m. Presented by the Napa Valley Jazz Society (NVJS). $45, $25 (NVJS members). Silo’s. 530 Main St., Napa. 707-224-5299. nvjs.org/tickets. David Kerns is a Napa-based freelance journalist. You can view more of his work at DavidKerns.com.